Nestled in the thick jungles of Corbett National Park, Jim's Jungle Retreat offers you a beautiful, unforgettable experience in the wild. 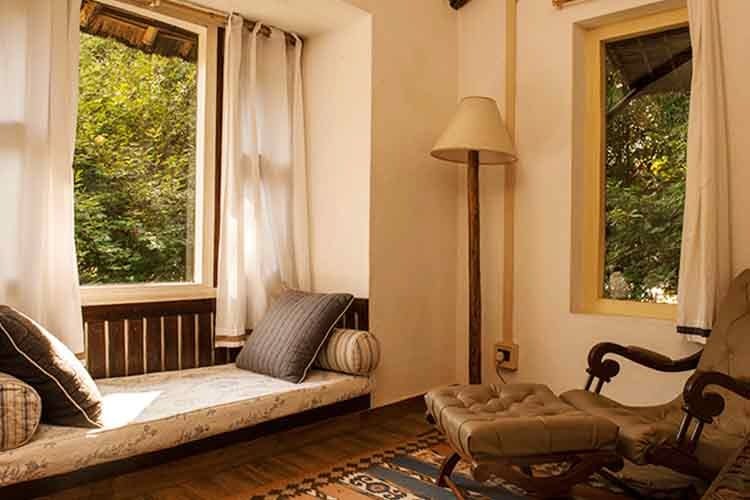 The jungle property is right at the periphery of the Corbett Tiger Reserve, and has 18 lodges and cottages widely spread out. The entire concept of the property is based on vernacular architecture and everything is built on sustainable means. The rooms are well-equipped with modern day facilities, and are always warm and cosy. It’s a blend of luxury, packaged perfectly well with ecological sustainability. The food cooked is fresh and organic and very delicious (we highly recommend their Kumaoni cuisine, fresh salads, and their desserts). The property also has a swimming pool, a spa, trail walks, library, art hall, recreational games and sports, open dining and a yoga hall—just the perfect place to get lost in. You’ll not find a dull moment at JJR. Their itinerary is packed with lots of activities including a jungle safari (yes, for tiger sightings) and a cycling excursion to the nearby village. They also have an early morning river walk, wherein you might see a tiger whilst walking by (definitely ask for one of the naturalists to accompany you for this one). They have an in-house kitchen garden where they grow some vegetables and lettuce, and they source all their ingredients locally from nearby villages. The network reception here is a bit slow. If you're someone who needs constant internet access, you might be disappointed. Although, some parts of the resort have WiFi connectivity, we love a vacation away from our phones and laptops. Since only a limited number of people are allowed into the forest, make sure you book your safaris well in advance (at least a month), so that they’re available when you want to go.